Looking to book more shows in February? 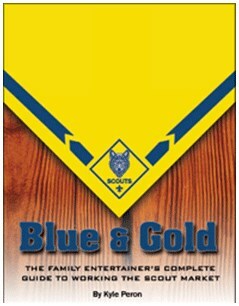 Performing at Cub Scout Blue and Gold dinners may be the answer. This 60-page eBook is jammed full of the most relevant information in regards to working any scouting program or event -- and it's one of the ONLY books that is devoted solely to giving you the information you need to work a market that can generate income for you in what may be an otherwise slow time for your business. If you are already performing for children or families at private parties or community centers -- even if you only do strolling magic for parents and their children, then Blue and Gold Banquets are a perfect extension of what you are already doing. You can learn to work them well by simply modifying your current show and having an understanding of how to market effectively to scout leaders. In the Blue and Gold eBook, Kyle tells you how. The contents of this eBook teaches you not only how to understand the Scout market, but it also shares the qualities that Scout groups are specifically looking for in an entertainer. It shows you step-by-step techniques on exactly how to market to scout groups so you can land the gigs you want to be doing. Kyle also gives you his complete lead generation letter, follow-up letters and full templates that he has used for years to handle all aspects of communication and marketing. Add a new market to your business. Learn the tips and techniques to work the Scout market and master it by giving the Scout groups a perfect entertainment solution. If you want to learn all there is to know about Scout groups and how to work them in February (and the rest of the year, too! ), download Kyle Peron's Blue and Gold. Here is what many folks are ALREADY saying about Blue and Gold! The Family Entertainer's Complete Guide to Working The Scout Market!